What Is the Connection between Phosphorus and Water Quality? The association of P with eutrophication of surface waters has resulted in a significant focus on the role of P in animal agriculture. P-related research in recent years has concentrated on two main areas: reducing P excretion from livestock and application and transport of P on agricultural fields. 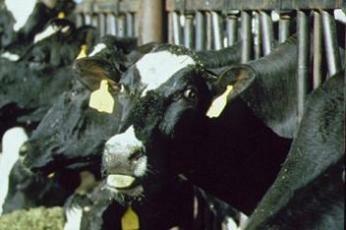 Lowering dietary P concentration has been a means of reducing P inputs to dairy operations. In 2003, a report indicated that, on average, dietary P concentrations were 34% above recommended levels. Reducing the dietary P concentrations in dairy cattle diets to recommended concentrations has not negatively impacted milk production, health, or reproductive parameters. The economic advantages of reducing P imports to the farm have helped to improve industry acceptance of this management practice and have led dairy producers and nutritionists to reduce the P concentrations in dairy diets. (Reprinted with permission from the author: Harrison et al., 2007). Harrison, J. H., T. D. Nennich, and R. White. 2007. Review: Nutrient management and dairy cattle production. 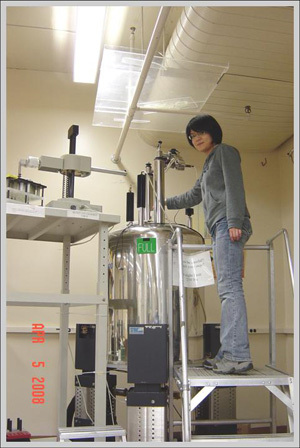 CABI Publishing 2007 (Online ISSN 1749-8848). Available online at http://www.cababstractsplus.org/cabreviews (Verified 14 December, 2010). Sharpley, A.N., T. Daniel, T. Sims, J. Lemunyon, R. Stevens, and R. Parry. 2003. 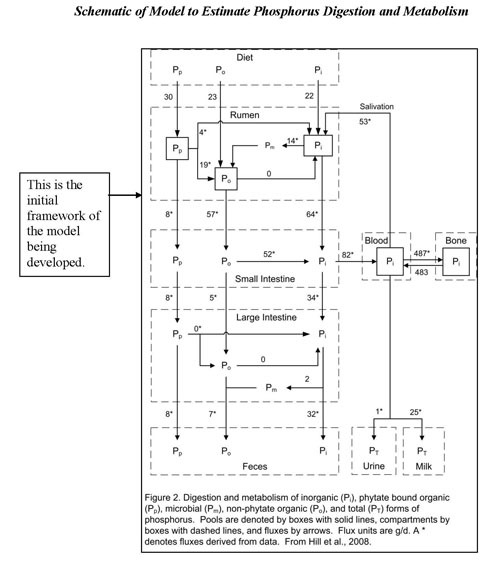 Agricultural Phosphorus and Eutrophication, 2nd ed. U.S. Department of Agriculture, Agricultural Research Service, ARS–149, 44 pp. A project started in February 2009 to enhance feed management practices to reduce manure phosphorus excretion in dairy cattle. This project takes an “integrated approach” to increase the adoption of reduced phosphorus feeding on dairy farms. 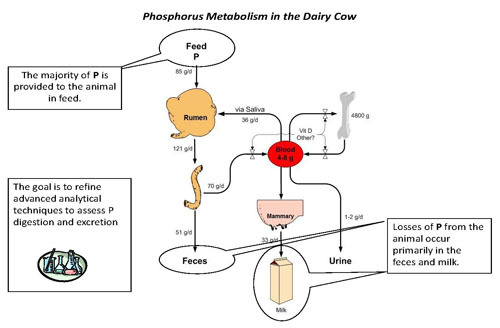 Improve our accuracy of meeting the phosphorus requirement of the dairy cow without oversupplying phosphorus in the ration by better understanding the availability of phoshorus in feedstuffs (reduce current practices of overfeeding phosphorus to ensure that the animal requirements of phosphorus are met). This project has been funded by the USDA National Research Initiative Program from 2009 through 2012. Develop analytical techniques to improve assessment of phosphorus digestion and excretion in lactating cows. Evaluate the variation in digestion and excretion of phosphorus-containing compounds in lactating cows using the newly developed analytical techniques. Develop and test a model that will more accurately estimate phosphorus digestion and metabolism in lactating cows. The model will be used in dairy cattle ration formulation. Develop, implement, and assess an effective information transfer process to encourage adoption of research findings via educational tools and on-farm assessment. 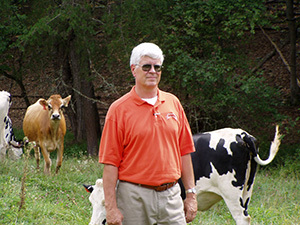 Dr. Bob James, Virginia Tech dairy science professor, is leading a project where nine Virginia dairy farms have implemented feed management software to improve feed management through ration formulation and more accurate mixing and delivery of rations. cc2.5 Bob James and Lynn VanWieringen. This presentation was presented at the 2011 American Dairy Science Meetings in New Orleans by Partha Ray, M D Hanigan, and K F Knowlton. This poster was presented at the 2010 Land Grant and Sea Grant National Water Conference by Charles C. Stallings, K. F. Knowlton, R. E. James, and M. D. Hanigan. This poster was presented at the 2011 American Dairy Science Meetings in New Orleans by Jamie Jarrett, M D Hanigan, R Ward, P Sirois, and K F Knowlton. This poster was presented at the 2011 American Dairy Science Meetings in New Orleans by Partha Ray, M D Hanigan, and K F Knowlton. During this session on February 7, 2011, Katharine Knowlton of Virginia Polytechnic Institute and State University and Jimmy Hufard, a dairy producer in Virginia, discussed regulations pertaining to phosphorus and how these can affect the dairy farm.